Known as a Mecca for Asian art, the Museum of Fine Arts, Boston has been collecting Japanese art since the days of Ernest Fenollosa and Okakura Tenshin, and is now said to be home to over 100,000 works. In terms of both quality and quantity, this collection is one of the best in the world and contains many superlative artworks indispensable for an understanding of Japanese art. This exhibition provides an opportunity to view masterpieces from this collection, with a focus on paintings, including several from the Bigelow Collection. 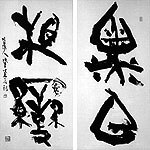 The year 2012 marks the 100th anniversary of the birth of Aoyama San'u (1912-1993), who was a prominent calligrapher during the Showa and the Heisei eras. He studied under Nishikawa Yasushi, and while producing works he avidly studied classics. As he reached his pinnacle as an artist, he also worked earnestly to spread and teach Chinese-style calligraphy methods through his many writings and lectures. He was awarded the Order of Culture in 1992. This exhibition features the Chinese paintings and calligraphy, along with stationery, that Aoyama San'u enthusiastically collected throughout his lifetime together with his selected masterworks, to give a retrospective of a representative Japanese calligrapher. Contemporary Chinese art, which continues to thrive, arguably has its origins in the achievements of many modern Chinese painters who lived during the turbulent 20th century. This exhibition features 50 representative works of 20th-century landscape painting selected from the National Art Museum of China (Beijing), a museum with a world-leading collection of paintings in this field. Through these works, the exhibition explores trends and movements in modern Chinese painting. This year marks the 1300th year of the compilation of the Kojiki, which records mythical legends related to Izumo. In addition, next year is the year for the shrine to be rebuilt and renewed after a period of approximately 60 years. In commemoration, this exhibition introduces the sacred land of Izumo through precious cultural assets, beginning with the sacred column (uzubashira) and other treasures of the Izumo Oyashiro, as well as a designated National Treasure bronze sword, halberds, dotaku bells, arms and armor, swords, and representations of deities. China has a population of 1.3 billion people, and is a country with the fourth largest area of land in the world. With more than 50 ethnic races, the giant country has maintained a history of as long as six thousand years. This exhibition focuses on the capitals and central regions of the dynasties of China. Based on the latest accomplishments of excavation research, this exhibition looks at unique objects from the provinces, and aims to view Chinese civilization from a new perspective. Enku (1632-95) was a Buddhist monk and sculptor who is said to have carved 120,000 Buddhist statues in his lifetime while making pilgrimages to sacred mountains all over Japan. Using wood from forests in the places he visited, Enku readily created Buddhist statues. Many of his statues are unpainted and clearly show knots in the wood as well as places where the wood was chopped or chiseled. Conveying the wood’s vitality, Enku’s unostentatious statues of Buddha were favored by villagers from the Edo period (1603-1868) onward, and even today they attract many admirers. This exhibition introduces 100 Enku’s statues from Takayama City in Gifu prefecture, with a focus on 61 Enku’s statues from Senkouji temple, including the Seated Ryomen Sukuna, a prized statue of a two-faced deity. There are also statues with the inscribed names of mountains Enku climbed, including Mount Hotaka and Mount Norikura. Standing like trees in the exhibition room, Enku’s statues evoke the atmosphere of Hida’s forests. Active in 4th-century China during the Eastern Jin dynasty, Wang Xizhi (303?-361?) greatly advanced conventional calligraphy styles, with his calligraphy treasured by successive Chinese emperors. Focusing on important materials related to Wang Xizhi’s calligraphy, this exhibition searches for the true image of the work of this master calligrapher, and attempts to reevaluate the roles that he played, for example through his influence on later generations.